Crepes can be found in Mexico in both sweet and savory forms. And oh how much they are loved. Inherited from the short reign of Maximilian and Carlota in the 1860s, French cuisine has had a big influence on Mexico’s kitchens. My sister Alisa, who is a French trained Mexican pastry chef, shared her favorite recipe with me. I have found it to be the very best, and I am sharing it with you, in turn, below. • Whether you use a crepe pan or a normal skillet, make sure it is non-stick. • Go for a pan that is the same size you want your crepes to be. The sides of the pan will act as a natural border for the diameter. If you want smaller crepes, use an 8-inch pan; for larger ones, go for a 10-inch. • For fluffier crepes, whisk or puree the batter without adding water first. Once fully emulsified, add water and whisk or puree again. 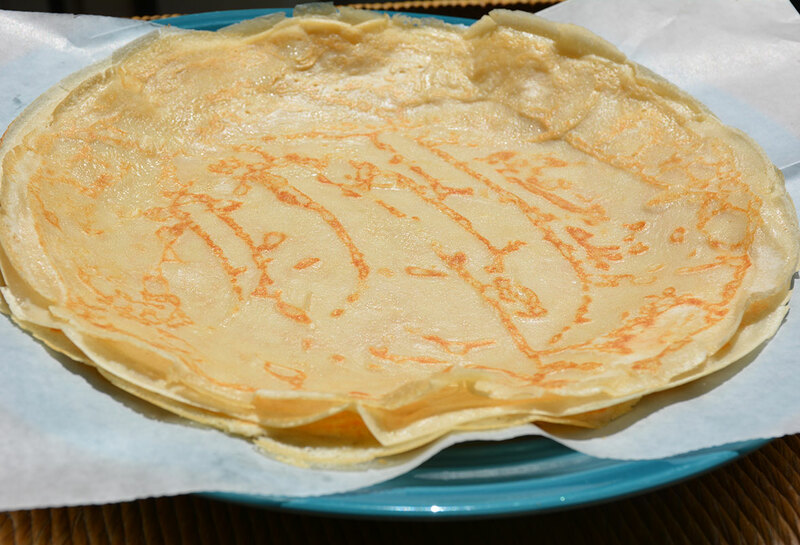 • For even fluffier crepes, let the batter rest for at least 30 minutes in the refrigerator before cooking: the ingredients will have time to come together and act in unison in your pan. • Make sure the pan is already very hot before adding the batter, but heated over medium heat. • Pour the batter on one side of the pan and quickly tilt the pan, so the batter covers the rest of the pan. 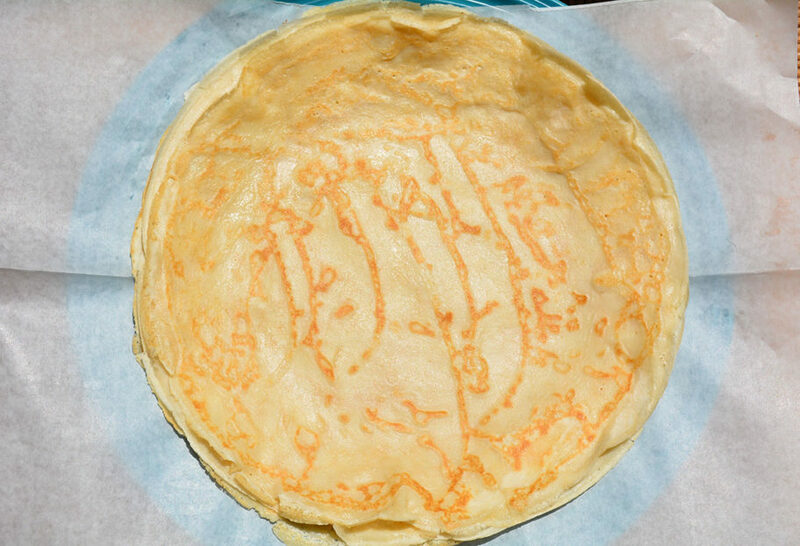 • Don’t touch the crepe until it has created a light crust on the bottom, and the sides seem a bit dry and naturally let themselves be lifted from the pan. • Flip to the other side with determination, so they don’t break. • Don’t sweat it if your first crepe is a disaster. Like many things in cooking, including making pancakes or a batch of rice, after you mess up once or twice, you will forever get the hang of it. Persistence definitely pays off. In a small pan, heat the butter over low heat until it melts. Set it aside. Place the flour, eggs, milk, sugar, salt and melted butter in the blender and purée until smooth, for about 10 seconds. Add water and blend again until smooth. You can also mix the ingredients by hand, following the same order. Place the batter in a container, cover and refrigerate for at least half an hour, or up to a couple days. Once ready to make the crepes, whisk the batter well with a fork or a whisk, or shake it in the sealed container. Set a crepe pan or non-stick skillet over medium heat for a couple of minutes. Butter the bottom of the pan and ladle about 1/4 cup of batter onto it. Instead of working from the center to the sides, tilt the pan and pour the batter over one side and spread it as quickly as possible over the rest of the pan, so that it covers the entire surface. Cook for about 20 to 25 seconds, until edges are cooked and begin to dry out and the bottom of the crepe is lightly browned. With a small spatula or fork, lift one edge of the crepe and turn it over quickly with your fingers. Cook the second side for about 10 to 15 seconds, or until it has lightly browned. Flip the crepe onto a plate. Repeat with the rest of the batter. After 3 or 4 crepes, you may need to butter the pan again. If it isn’t a nonstick pan, you may need to do it for every one. Stack the crepes on top of each other with the first, darker side down. That darker side will become the outer layer of the crepe, once you fill them up or fold them. If you aren’t going to use all of the crepes at once, or if you are making them ahead of time, wrap them in plastic wrap and place them in a closed plastic bag. Store in the refrigerator up to 4 days or in the freezer for weeks. NOTE: If making sweet crepes, I use this same recipe but use 2 tablespoons sugar instead of 1 teaspoon, and only a pinch of salt instead of 1/2 teaspoon. Aww thank you so much, Patti! Que Rico!!! Muchas gracias pati por compartir!! Tengo años intentando las crepas y me doy por vencida ahora si por seguro tendre exito !! Yeah mis peques estaran feliz !!! Patty donde puedo very tus videos ?? Me encantaria volver a ver el de la Tamaliza que hiciste con tus amigas?? Ahora que viene el dia de la candelaria!!! Estoy muy orgullosa de que seas mexicana!!! Dios te bendiga Pati!! I’m Malaysian.I’m happy to enjoy your tv show.Wonderful & simple recipe. Thank you for sharing your love of food and cooking! I enjoy your descriptions, conversation, and the knowledge you share with us; it really transmits that spark and motivation to cook and feel nourished with the entire experience that it is. Thank you Pati! Hola Nancy! Thank you so much for your lovely note. It brings me joy to hear this!! great idea, for this ‘caliente’ time of year! THANK YOU,Pati! What a wonderful recipe of your Sisters. And the directions are the best. Thank you again!